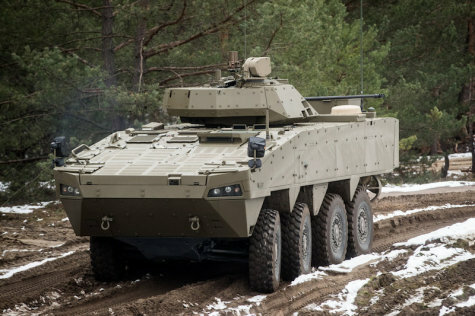 The MOD will propose the Cabinet approve the procurement of the Vydra (‘Otter’) 8x8 armoured IFV. Up to 16 SVK firms could become involved in the production of the IFV. Next week the MOD will initiate interdepartmental consultations on the proposal. As the MOD has stated before, the document will be Unclassified. In addition to technical company trials, verification trials and military trials, the IFV prototype has successfully undergone additional verification and military trails in order to test the proposed adjustments to the vehicle. Speaking at a press conference at the MOD today, Minister of Defence Peter Gajdoš said: “The vehicle is the result of international Slovak-Finnish development and most of it will be produced in Slovakia. The price of a single vehicle in the serial production, including all components, will not exceed €3.33 million, VAT excluded, in other words, the vehicle will cost up to €4 million, VAT included. Head of the MOD emphasised that the support of the SNS-led MOD for the SVK defence industry’s involvement in the programme is substantial. “We will create jobs for our citizens at home. I think there is not a single country that would prefer a foreign product to its own. Otherwise, in the event of crisis or war we would never be able to ensure deliveries of spare parts and maintenance support to the Armed Forces,” he explained. As General Secretary of the MODʼs Service Office Ján Hoľko added, SVK defence companies will be selected for serial production of the vehicle in compliance with the Public Procurement Act. “Besides this, the project creates prerequisites for wider benefits to SVK economy, ranging from sustaining the key capabilities of the Slovak defence industry, creating jobs, generating tax revenues for the state budget, through to paying dividends and insurance premiums. Over the duration of the 7-year contract this could reach over 42 million euros,” he said. The MOD plans to procure up to 81 Vydra vehicles, whereas the overall price will not exceed €417 million, VAT included. This includes logistical support (€17 million), munitions (€65 million), infrastructure (€5 million), and the purchase of the prototype (€5.8 million). The reason why the designation of the vehicle is ‘Otter’ is that, just like the animal, it has a swimming capability and is very dynamic, fast, agile, resistant and easily manoeuvrable in spite of its size.